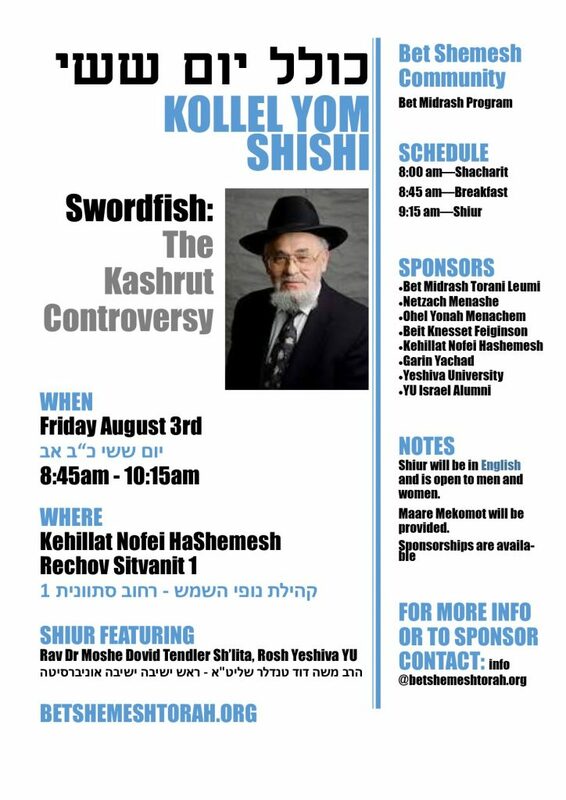 Please join us Friday August 3rd at Kehilat Nofei HaShemesh to hear Rav Moshe Dovid Tendler Shlita discuss “The Swordfish Controversy”. Links to the Marei Mekomot here and here. We are excited to announce that Rav Eitiel Goldwicht shlita has agreed to present the shiur on June 14th. 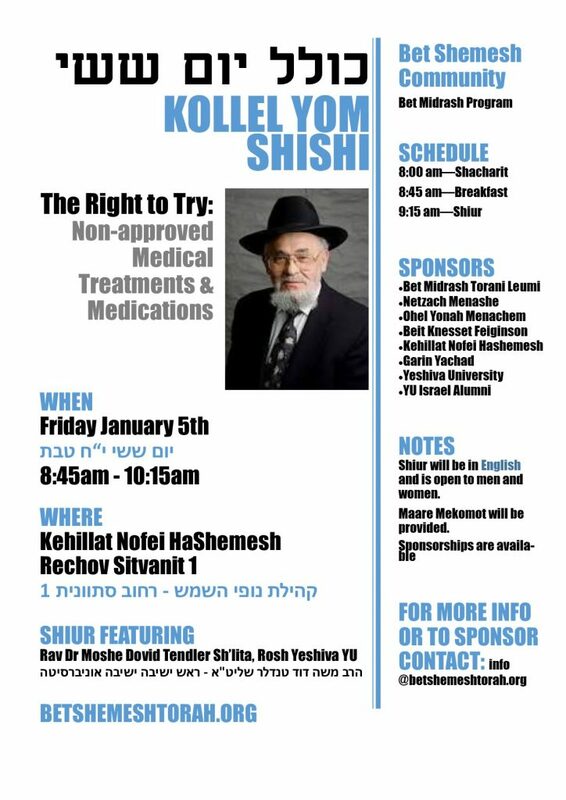 The shiur will take place in BMTL in Bet Shemesh (Rechov Asher 1). The topic will be “Tzitzit: A Mitzvah with Strings Attached ?” The shiur will be in English. Marei Mekomot will be provided. The schedule: 8:15pm Maariv followed by Shiur at 8:30pm and a Kibbud at 9:30pm. 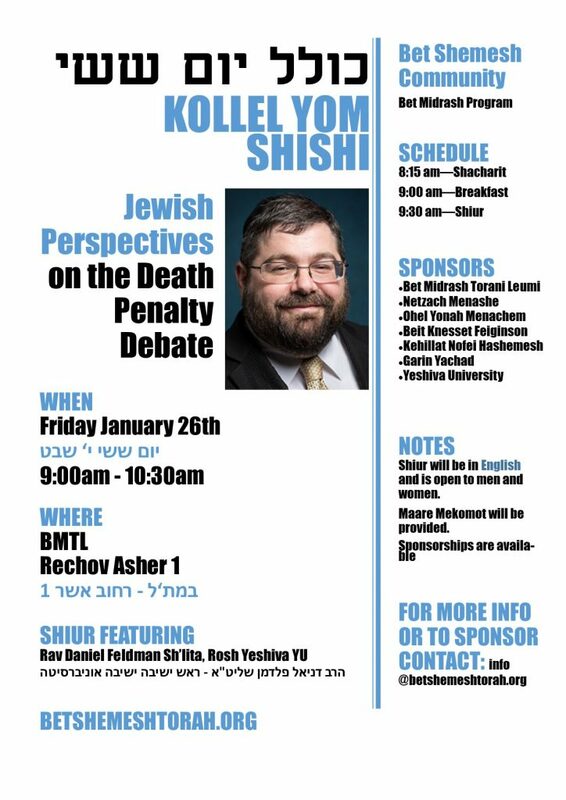 We are excited to announce that Rav Asher Weiss shlita, the “Minchat Asher”, has agreed to present the shiur on March 25th. 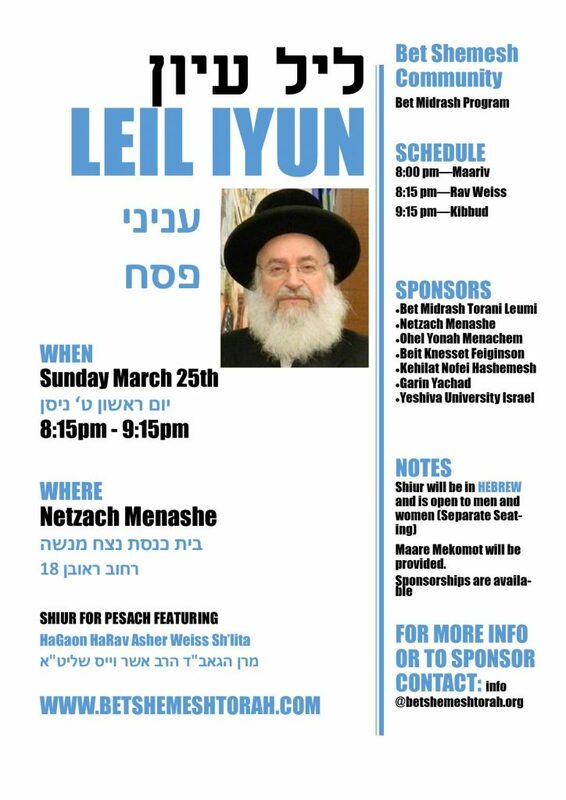 The shiur will take place in Netzach Menashe in Bet Shemesh. The topic will be “עניני פסח”. 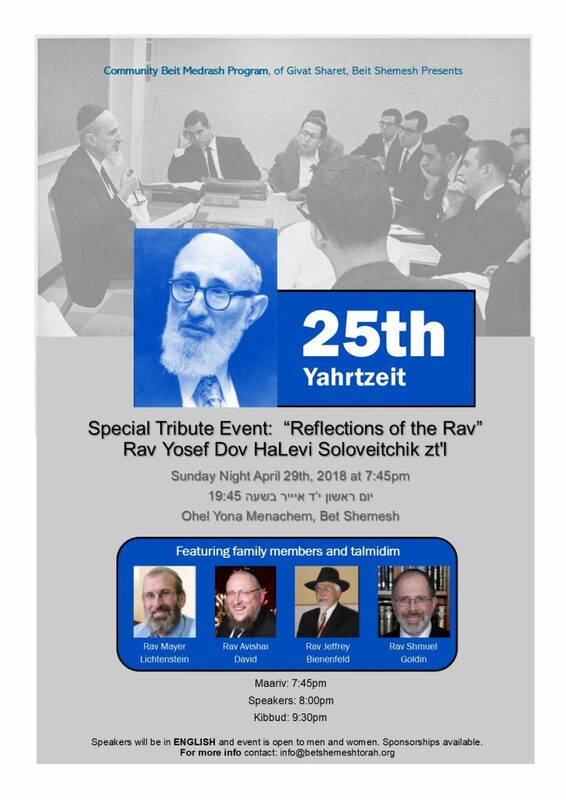 The shiur will be in Hebrew. Marei Mekomot will be provided. The schedule: 8:00pm Maariv followed by Shiur at 8:15pm and a Kibbud at 9:15pm. We are excited to announce that Rav Asher Weiss shlita, the “Minchat Asher”, has agreed to present the shiur on September 24th. 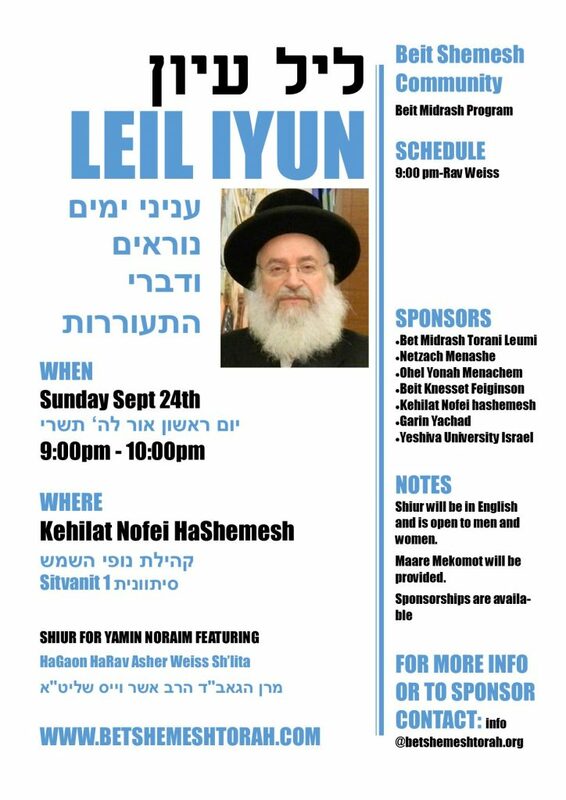 The shiur will take place in Kehilat Nofei HaShemesh in Bet Shemesh. The topic will be “עניני ימים נוראים ודברי התעוררות”. The shiur will be in English. Marei Mekomot will be provided. The schedule: Shiur at 9:00pm and a Kibbud at 9:45pm. 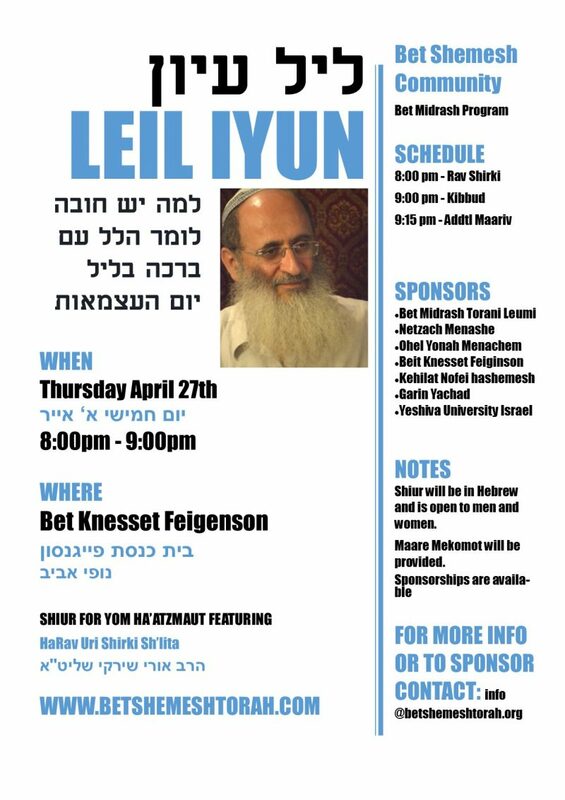 We are excited to announce that Rav Asher Weiss shlita, the “Minchat Asher”, has agreed to present the shiur on April 4th. The shiur will take place in Bet Midrash Torani Leumi (BMTL) in Bet Shemesh. The topic will be “עניני פסח”. The shiur will be in English. Marei Mekomot will be provided. The schedule: 8:30pm Shiur followed by Maariv at 9:30pm and a Kibbud at 9:45pm.